Home Reviews 5 Reasons : Tego Run T-Shirt a Must Have in my Run Wardrobe! 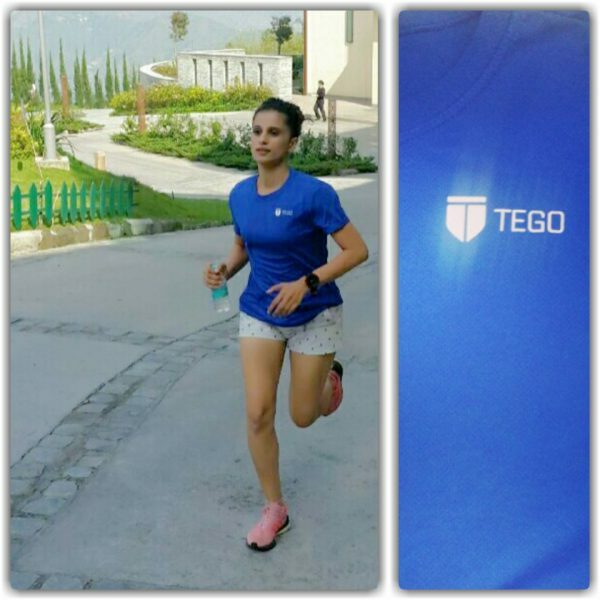 5 Reasons : Tego Run T-Shirt a Must Have in my Run Wardrobe! I stick! I am finicky! I am stubborn about my running shoe brand! There is a certain brand and fit that works for me and I will not compromise till thy give up on the production – but then that’s for my shoes! Running apparel is where the everyday fun lies! I am experimentative and look for new running apparel every now and then! Especially T-shirts! As a true-blue fashion runner, I have all kinds of running t-shirts in all sorts of colors sitting in my closet – long sleeves, racer-backs, halters – you name it! The big sports brands are a no-brainer and have never gone wrong. It’s the Indian sports brands that I have been experimenting with and I’ve had my share of many disappointments and a recent win! So after 1 month, 13 runs, 3 cities, and many washes later -here I am ready to write a review on my interesting new find! My Tego Sweat Charged T-shirt. The lesser known brand – TEGO! So when I have everything, why do I need a TEGO Running T-shirt?Because it’s an absolutely no-nonsense, must have, I want a total comfort feel- kinda T-shirt! I did my first run inTego t-shirt in extreme humidity of about 88% -a long slow distance run and I wasn’t sure if it could hold the sweat well enough! But guess what!! Knock, knock! It’s as comfortable as it gets! And that’s a first for me for my runs! And that’s where Tego did fantastic! No abrasive seam sewing and no chaffing post long runs! It’s a 100% mesh polyester hence it stayed smooth, light and flowy on the skin! It is true to its claim of wicking away sweat and controls odour. This feature is a USP with this running t-shirt by Tego. I like the classic minimalistic look of the logo. It does not scream the brand which is something I admire about brands that are working so hard to make it! It’s got more coverage than a lot of other running shirts. The sleeves are not too short. They are sized for comfort keeping everyday athletes in mind. It’s a no-brainer especially for a woman who runs in every city! It’s too basic, but it gives me the feeling of being safe no matter where I am running! It’s functional T-shirt that you can’t go wrong with. A good drying speed – we all know that better the breathability of a fabric, faster it dries! I washed 2 of my favorite running t-shirts and the new Tego Run t-shirt. Got each of the shirts dripping wet, hung them up next to each other, and checked every 40 minutes. I figured – it all depends upon the weather that day! Dries up as fast as the international brands! A Surprise Fun Fact : It was a plain blue t-shirt when I started running. Thick into the distance and sweat trickling down, I saw motivational words emerge from the fabric! It said faster, better and stronger! So you know when you are pushing yourself enough to sweat that’s when the motivational message appears! My verdict: Tego Sweat Charged Running T-shirt is great and a superbly affordable running t-shirt in the Indian Sports apparel segment that almost any runner would be happy with! Available for both men and women (S, M, L) in various colors at multi-brand sports retailers like Planet Sports and SportXS stores and online marketplaces like Amazon and Flipkart. Click on Tego to know who they are! All opinions in this article are my own. I don’t review any products that I don’t use. You are welcome to write to me at tanya.singla@gmail.com in case you need to know more.